You probably know about Google Web Search because it is a search tool that is used by over 75% of internet users in the world to search for items on the World Wide Web. Besides “Googling” as we know it, a term used by the average internet user, did you know that Google also has a specialized web tool to exclusively search for scholarly / academic material on the web? 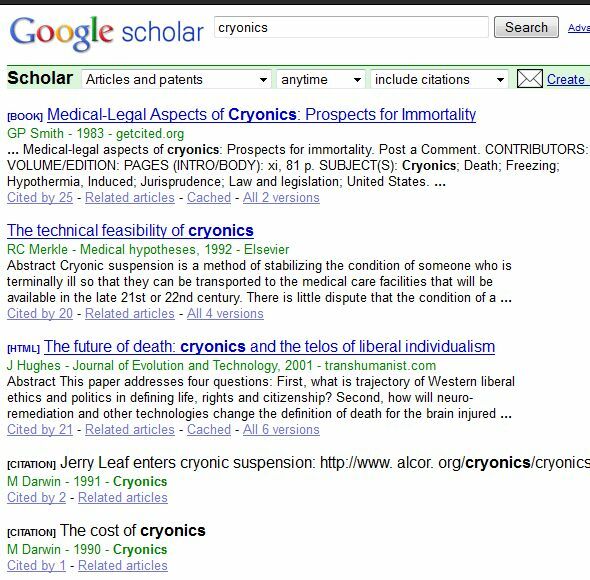 This tool is known as Google Scholar and it is currently in beta testing but fully functional. This search tool is a search engine created for researchers, college / university students, professionals, scholars and academics. It will help you find academic papers, research papers, college essays, reports, books, articles, semester papers, dissertations, theses, scientific papers and any type of scholarly material from diverse sources across the web, ranging from libraries to universities. You will get information from research centres, professional bodies, reputable websites, centres of learning, government bodies, private institutions and so on. The best has been done to cover all areas of research and you will be able to read or download full documents from reputable libraries across the world. 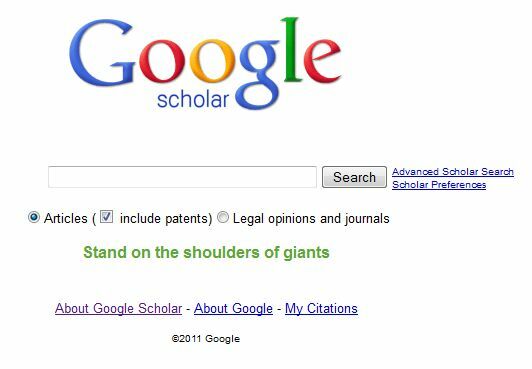 Instead of using Wikipedia or Google Web search to look for scholarly material, you should use a search engine that is made for that purpose – Google Scholar. The way documents are ranked on Google Scholar is different from how webpages are ranked on Google Web Search. The method of ranking documents on Gogle Scholar follows the professional standards used by researchers. Factors such as the Author, Full Text weightings, where the material was published and the number of times that the material has been referenced in other academic publications is taken into consideration. 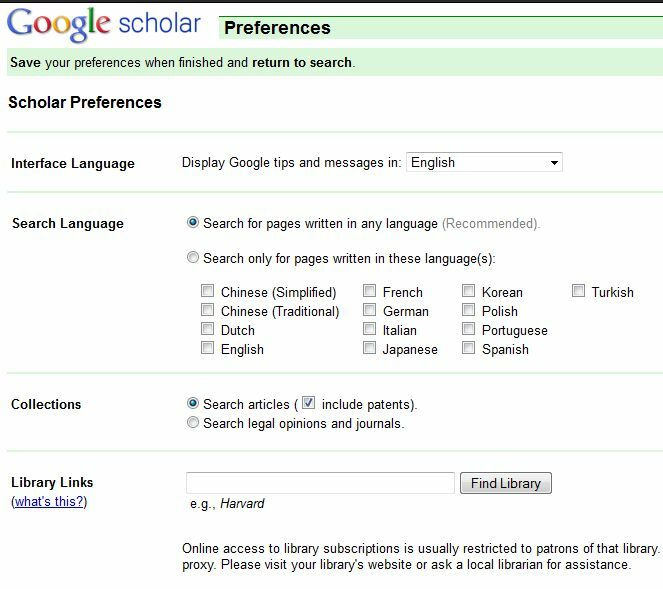 Publishers as well as Librarians can expose their materials to online visitors by having their content indexed on Google Scholar. Once the content is indexed, it can be searched and found by people looking for it. By converting their library resources into electronic or print format, Librarians can make their documental resources available online to researchers and scholars. The home page includes a Search Box with the logo “Google Scholar” above. 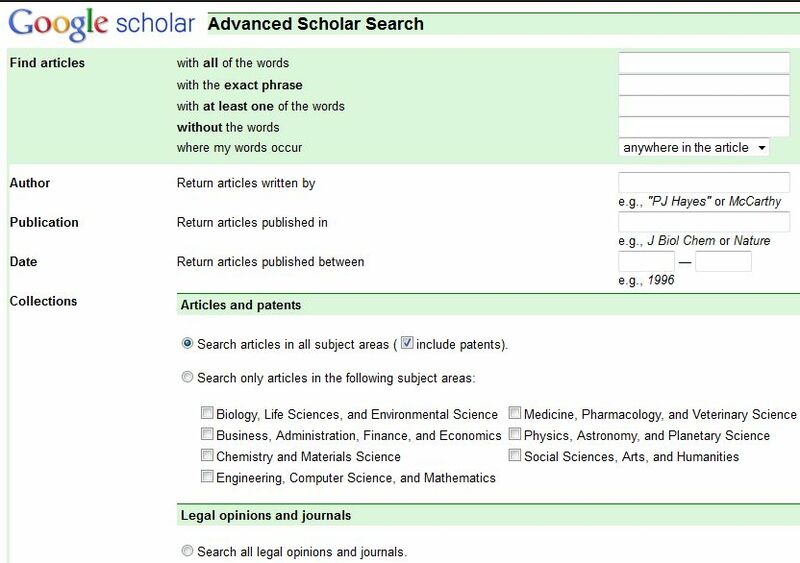 Enter your keyword and tick one of the two options below which filters your search to either “Articles” and “Legal opinions and journals”. For “Articles” you can tick the “include patents” box if you want to include these in your search results. You can then click the [Search] button. You can show up to 100 results per page. Just select a number from the [Results per page] drop-down box at the top right hand corner. There are many search parameters on this page to narrow down your search.First, you have to specify the words or phrases that you want to use for your article search in the “Find Articles” field. You have 4 options and therefore your search query can include [All words] or [An Exact Phrase] or [One of the words specified] or [Without certain words].In the last box, choose one option in the drop-down box: to search [Anywhere in the article] or [In the title of the article]. In the “Publication” field, enter the name of publication or the discipline, subject ,faculty, or area of research or field of study, for example “Atomic Physics “or “Global Warming”. Under “Collections – Legal Opinions & Journals” you can have 3 options: To search all journals/legal opinions, To search by court or state. Just click and open the drop-down menu to select your options. The “search by court” parameter includes the United States Supreme Court, Federal Curcuit, Tax Courts & Boards of Tax Appeals and All federal courts. Only the states of the United States are included in the “search by state” parameter. You can also click the [Select specific courts to search] to choose from a list of courts that you are interested in. Click the [Search Scholar] button when you are done. These preferences can be saved so that they will apply every time you do a search. The preferences page starts with the “Interface Language”. Choose from the drop-down menu, the language you want to use when receiving Google messages and tips. The second field is the “Search Language”. It is recommended that you search for documents written in any language so that you can avoid excluding any relevant info in another language.However, you can only search documents in one or more languages if you want. Supported languages include English, Dutch, French, German, Italian, Japanese, Korean, Polish, Portuguese, Spanish, Turkish,Traditional Chinese and Simplified Chinese.You can search for Articles, Legal Opinions and Journals. The “Library Links” field allows you to find libraries with links / references pertaining to your search parameters on Google Scholar. As an example, if you type “University of Chicago” in the Library Link Bar, you will get relevant links from the University of Chicago Library. Some online libraries are only accessible to members so you might be required to join and be a member of that library in order to get a password to log in. With some libraries, they might only be accessible through a campus intranet / network so you will need to be within the perimeter. Better still, you might try a library proxy. Choose the number of results to show i.e. 10, 20, 30 or 50, then scroll down and click “Save Preferences”.